According to AARP aging in place is a goal for 3 out of 4 Americans aged 50 or more. These seniors and near seniors are willing to employ alternative solutions to facilitate this. The alternatives include home sharing (32%), building an additional or accessory dwelling unit (31%) and locating into villages that provide services which enable aging in place (56%). These communities become a source of support and engagement for residents and give a sense of grounding through memories of a long time home environment. Seniors who want to reside in a community (aka, age in place) rather than seek residential institutions or nursing homes are mostly dependent on unpaid caregivers and family members for assistance with activities of daily living (ADL). These activities include laundry, self-care actions like bathing and dressing, meal preparation, and transportation. Medicare provides some long-term care services and supports (LTSS); however, the LTSS program falls far short of the need. While the aging population in America is rapidly increasing, lawmakers are slow to respond to the insufficient funding to increase the availability of LTSS for seniors choosing to age in place. The goal of LTSS is not to replace but to supplement the contribution of unpaid family and caregivers. The addition of a Medicare benefit to support family caregivers as they help their loved ones would enable more aging adults to successfully remain in their homes. Technology has provided some solutions for caregivers, allowing caregivers to monitor their loved one remotely while they stay engaged at work. Smart environmental controls and personal assistants have lightened the load of constant oversight but cannot replace the helping human touch. 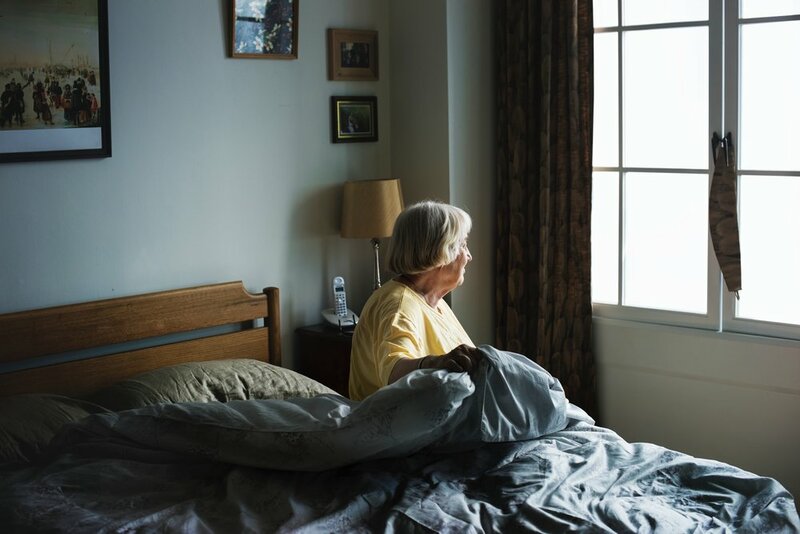 Nearly 60 percent of seniors who have seriously compromised mobility report being house or apartment bound, while 25 percent of those seniors say they often remain in bed and do not dress daily. Low tech devices like canes, walkers, ramps, grab bars, shower seats and raised toilets to increase the level of accessibility and safety for aging in place seniors, however, transferring in and out of bed and moving around their homes still provides notable difficulty for many. The senior who wants to age in place is typically independent-minded and therefore have trouble foreseeing a time when help is not a want but a need. Aging adults and their families need to plan to address changing physical capacities before an adverse health event such as an unintended fall or dementia challenges change everything. While aging in place is a great goal for many seniors it requires planning just as if they were planning on moving into an assisted living facility. Johns Hopkins researchers report 42 percent of older adults who have problems performing ADLs or are living with probable dementia receive no assistance at all from family, friends or paid caregivers. That is a staggering number of unaided seniors. Additionally, twenty-one percent of seniors with a minimum of three chronic conditions and high needs received no assistance at all. LTSS through Medicare will have to make changes to meet the ever-increasing demand for human caregiving. Approximately 60 percent of at home seniors use at least one low tech device, most commonly for bathing, toileting or in-home movement, throughout their day but their needs multiple as they age. Unfortunately, Medicare does not cover the expenses of most of these nonmedical devices and services. The resulting problem is seniors near, or at the bottom of the income ladder go without assistance, human or device, putting their daily lives in a very precarious position. Hardships for these seniors on the razor's edge include the inability to pay medical bills or prescription costs, utilities or rent, and some resort to skipping meals to balance out their unaided lifestyle. At best this is heartbreaking, at worst it is inhumane. The CHRONIC Care Act will allow Medicare Advantage plans to offer supplemental benefits for seniors to cover devices such as wheelchair ramps, grab bars, personal care, and transportation to chronically ill seniors however there are 21 million people who have needs to be met and how this will be paid for is unclear. Meanwhile, the 39 million people enrolled in traditional Medicare are entirely left out of any supplemental benefit. Affordability for at home care is a significant issue on a personal, family, and government level. Caregivers and assistive low tech devices are an absolute necessity for seniors opting to age in place. The extent of the adjustments senior adults make as their needs become more profound are not well documented. As aging in place is a common strategy now, new solutions and programs must be explored to ensure successful aging. If your strategy is to age in place, have a discussion early on with trusted counsel and family members to address some of the challenges you will eventually have to overcome. If we can assist you, please don’t hesitate to reach out.